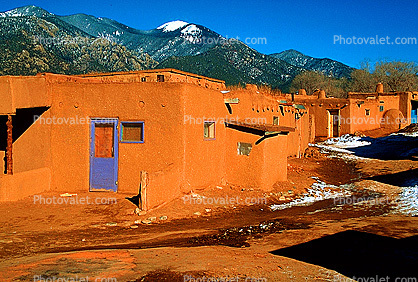 Taos is situated in the valley of a small tributary of the Rio Grande River called Rio Pueblo. This community is made up of habitats and ceremonial centers largely derived from the traditions of the pre-historic Anasazi Indian tribes. These buildings are made of adobe in two to five-story residential blocks, many still accessible only by ladder, the original defensive wall, kivas and the ruins of the mission that once stood there. It is believe to have appeared before 1400.